Super White Apoxie® combines the features and benefits of sculpting clay with the adhesive power of epoxy! It has a firm/fine grain consistency and crisp white color that allows more details to be seen. Snappy set-up (1 hour) self-hardens (No Baking); cures rock hard to a smooth, semi-gloss finish. Excellent resin compatibility; adheres to most clean surfaces. 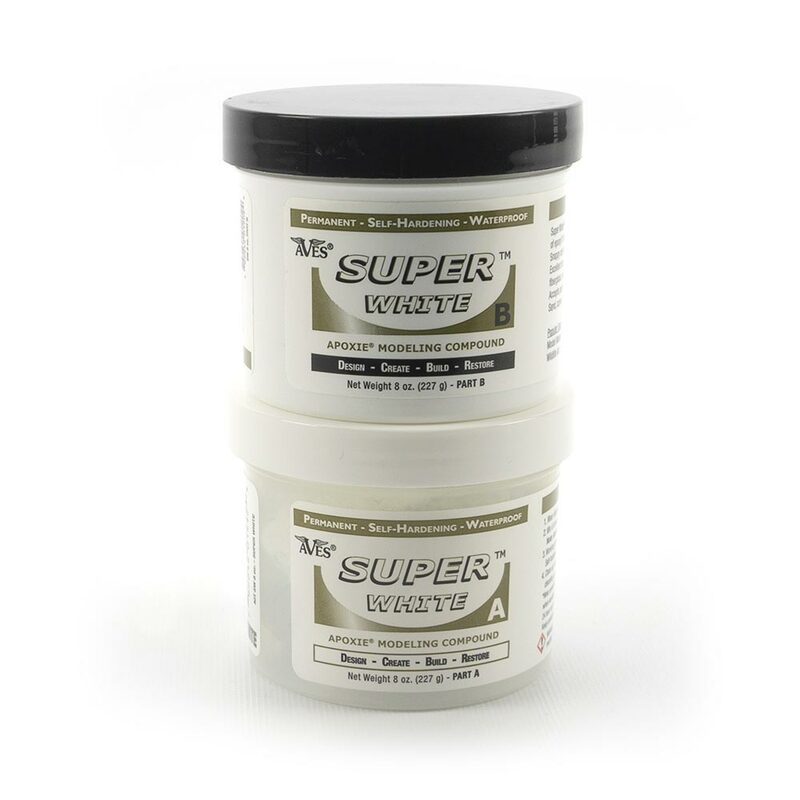 Great for sculpting, embellishing, bonding, and filling. Accepts paints, stains, mica powders and more for a variety of finishing and accenting options! You can mix & match Super White Apoxie® with our regular Apoxie® Sculpt that comes in 12 colors. Adheres to: Itself (in any stage of set up before or after curing), Resin, Plastic, Polymers, other epoxies, Glass, Stones, Fiberglass, Wood, Metals, & more! Mix & knead together for 2 minutes until thoroughly combined and a uniform color is achieved. Note incomplete mixing will give poor results. *Allow mixed product to rest 5 minutes for better handling. Super White is ready to use; working time is 1 hour. Shape as desired. Smooth or texture with a wet finger, brush, Q-tip or sculpting tool. Self-hardens (NO?BAKING); 24 hour full cure. Clean up: soap & water or Aves® Safety Solvent (very helpful for smoothing, removing finger prints & cleaning up pigment / product residue before set-up). Finish as desired. Paint wet or dry. ?Marine & Exterior Quality! WARNING – May cause an allergic skin reaction and eye irritation. Hazard Statements – H317 May cause an allergic skin reaction. H320 Causes eye irritation. Super White Apoxie® Conforms to Safety Standard ASTM International D4236. Popular Uses Include: Arts & Hobbies, Embellishing, Jewelry, Mosaic Work, Aquatic Projects, Model Making, Prototypes, Sculpting, Outdoor Displays, Statue Work, Resin Filling, Wildlife Art …and more! Be Creative with Your Own Uses! *Use this product if you want a bright white color.